million inhabitants. There is no other city in North America one can experience the European charm and French culture that Montreal has. Whether partying at one of the many gay events scheduled throughout the year, gambling at the huge Casino de Montreal, shopping the Underground City that includes Eaton Center Mall, or just exploring Old Montreal, there’s no escaping the excitement and energy that pervades the entire city. Many people who visit Montreal during one of their party events such as Black and Blue don’t take time to explore this wonderful city. Although the parties are great, one should always take time to peruse areas outside of the Gay Village. Old Montreal is just steps from the Village down by the St. Lawrence River. In the summer you’ll see speed boat rides on the water, outdoor cafes jammed with folks soaking up the great weather, horse and carriages touring visitors on cobble stoned streets. This is Montreal at its best. An area where you never know what you might stumble upon, such as a glass-blowing artist or even a clown. It is an area bound by Canadian Indian’s selling their wares and French culture rolled up all-in-one. city. And then there are the beautiful Botanical Gardens across from the space ship looking Olympic Stadium. These two attractions could easily keep you busy for the day. The gardens with varied themes such as the Asian inspired Japanese gardens are most beautiful of course in the spring and summer. If you are a first time visitor to Montreal, you’ll notice one of the largest Customs areas you’ve ever seen. It is quite a hike from the gates but it is usually very efficient. Once through customs and retrieving your luggage, there are cab stands just outside. I suggest using your ATM card at the airport to get Canadian cash. If you use the money exchange booths, you don’t get the best exchange rates. Montreal has a wide variety of hotels for every taste. Most of the smaller hotels such as those in the Village are European styled (small-rooms). Many offer free breakfast such as Hotel St. Denis, Hotel St. Andre, or Manoir Des Alpes and are very quaint and have clean rooms at budget prices usually starting around $79 a night. 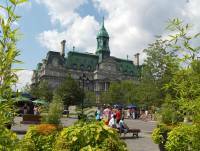 Larger chain hotels are also available as well and there is one in the center of the Village, The Gouverneur Place Dupuis. Standard chain hotels such as the Hyatt, Holiday Inn and others are only a few blocks from the Village. changed greatly in the last ten years. Like other gentrified areas, many of the small shops and eateries have been replaced by Ben & Jerry’s, Starbucks, and McDonald’ s. There are plenty of fast-food chains for a quick bite, however if you want to sit down and enjoy the true charm of Montreal, check out the gay favorite, Saloon on St. Catherine Street or for French style breakfast, go to Chez Cora. Crêpes and fruit are in plentiful supply as your waiters scramble to insure guests are taken care of in this busy goldmine of an eatery. Just remember if you sleep late, Chez Cora’s closes at 3 pm If there is one thing Montreal is not short of, it is restaurants. I recommend asking the hotel front desk for places that might meet your special cravings. Over the years, Montreal’s popularity with gay visitors grew from the many male strip bars. The two staples, Campus and Stock Bar have been written about countless times. As of late, Campus, a bit smaller than Stock Bar, seems to have the larger crowds. For those that like younger and thinner guys, there’s always Taboo. Private dances are $10-$20 a song (about 2-3 min). On point of note, many (about 75-85%) of the dancers are straight. For those that wish to partake of a sauna, there are plenty in Montreal. In the Village there are at least three and on special party weekends, they can be packed with visitors and residents alike. They are easy find and have reasonable rates. Montreal gay-nightlife is abundant and the main clubs are Club Unity and Sky Bar Complex but you’ll want to always do a bit of research beforehand because clubs change. What was popular this weekend may not be open next. During the special event weekends such as Pride or Black and Blue, these clubs are jammed with revelers. All are within walking distance in the Village and all offer different atmospheres. Multi-level complexes, each garners A-List DJs throughout the year. By law, clubs close at 3 a.m. however, special events may last until 8 a.m. with after-hours events many times lasting well into the afternoon. The larger party weekends include summer’s Pride (Divers/Cite), fall’s Black and Blue, and spring’s Bal en Blanc. These events take place in larger venues such as Palais de Congress or even the Olympic Stadium and upwards of 10,000 people may be in attendance. Whatever time of year you decide to visit Montreal, it is sure to have something of interest. 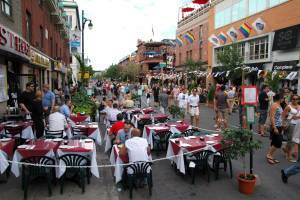 Whether you roam Old Montreal or party all night, Montreal is one of the best gay-destinations in North America to visit. With the European charm of France combined with reasonable prices and friendly locals, this is one city that is sure to please.